How Should You Spend Your CAD Management Time? If you're like most CAD managers, you have lots of tasks on your plate — but what's the best way to prioritize them? One question CAD managers frequently ask me is, "What should I be spending my time on?" This is a simple question, but — like many things in our profession — it has a multitude of answers, with varying degrees of complexity. I've always responded this way: "Spend your time on the things that make you more efficient, and avoid things that are overly difficult." This always leads to a follow-up question: "How do I know which is which?" In this edition of the CAD Manager's Newsletter, I'll share my approach with you and introduce you to a chart you can create to help you understand your own workload better. Here goes. It turns out that by dividing your workload into tasks and understanding a few metrics for each, you can gain insight into what you're doing — and what you should be doing. My method is to consider which tasks I'm responsible for, how often each task is needed, and the complexity of each task. The trick is trying to get all this information organized in a way that you can visualize it all. The best way I've found is to build a radar chart like the one below. You can use Excel to build your chart (read on for details), or just sketch it out by hand — but either way, do take some time to think about it. 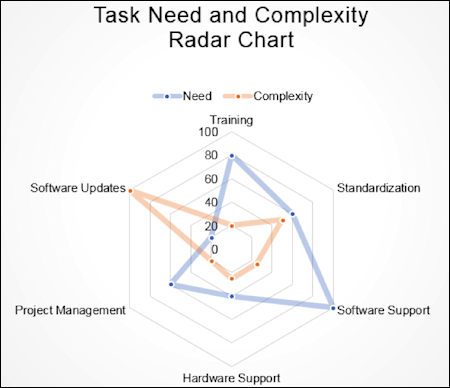 A radar chart that illustrates the need and the complexity of several CAD management tasks. What emerges is a pretty good picture of what your users need you to do, along with your estimate of how difficult each task is for you to perform, rated on a scale from 0 to 100. The blue line tends to indicate the time you'll spend on each task, while the reddish line indicates how much effort you'll expend. The next challenge is interpreting this data, and planning how to prioritize your time to be the most efficient. Let's start with software updates. I think we can all agree that software updates represent a substantial amount of work and a high degree of difficulty (represented by a high red value on the radar chart). Happily, they don't happen too often (as indicated by the low blue value), but they have a nasty way of forcing us to not only complete the update, but to deliver more training, more support, and alterations to our standards — the perfect storm of difficulty. Are we really gaining substantial productivity with this update? Will licensing and security remain the same with this update? Are the changes to the software interface minimal? Generative design is opening new opportunities for solving design problems. It's also turning traditional workflows upside down, moving simulation ahead of model creation. Understanding the basics of the technology can help you decide if it's time to share your AEC or product development workload with generative design tools. Register to download the new 9-page white paper from Cadalyst, "An Introduction to Generative Design," and get started exploring the terminology and technologies that are reshaping design. The Coordinate Metrology Society has launched a new digital library of original technical papers from the annual Coordinate Metrology Society Conference. The online archive comprises more than 100 technical papers and journals covering a broad range of industry topics including 3D measurement, inspection, assembly, best practices, and new innovations. A download fee applies for non-members.